Lately, I have been attracted to Lorca’s idea of cante jundo. Cante jundo being the Andelusian form of song sung by a single voice carrying a poetic verse. It is a voice of lament, encountering death and finding a deep spiritual bond residing between the cantor and the audience. This bond, when strong enough, produces an effect upon the soul that is deep and moving and ultimately life changing. The tenor of the voice carries the listener to a mythic place where one can meet one’s destiny and therefore, one’s self. It acts as an isthmus to an imaginative place allowing one to encounter those hidden forces that shape one’s life. And when in that space it allows one to ask the ultimate questions that need to be asked. Can such an effect be transferred to painting? Is there a reciprocal analogy? Can the form of a canto manifest itself through paint, through a visual image and be visceral enough to effect change in the viewer? Is the singer the artist’s own voice revealing through images the verse or poem? Will the encounter between image and viewer carry a power of change? A canto, I read, is a song or ballad; one of the divisions of a large poem; so much as the minstrel might sing in one ‘fit’ (c. 1590). In a sense, a painting comprises of one ‘fit’. Canto fermo (c.1789-Ital. ), is a simple unadorned melody of the ancient hymns and chants of the church; plainsong; hence any simple subject of like character to which counterpoint is added. A canto also comprises of a repetition of a verse that ties the song together. Would a multiplicity of form or a rhythmic repetition of gesture carry the same effect? Presently, I am conjuring up some images centered around “nocturnal flight”. Emergence; dissolution; encounters; conflict and freedom; memory and thought; a space for reverie. A place of longing, passion and gravitas. Baudelaire states that…” it is the nature of true art- works to be inexhaustible mines of suggestion”. (Baudelaire, Wagner and Tannhauser in Paris,p.125) Can a canto (suggestive images of a dream like state) present the viewer a path to his own reverie, conjuring up an intuitive association and attentiveness to his own internal images? Wagner states in his work, Letters on Music, ” The character of the scene and the tone of the legend together contribute to throw the mind into that dream state which soon carries it onward to full illumination, when it discovers a new concatenation of the phenomena of the world which the eyes could not perceive in the ordinary state of waking.” If a similar phenomena can occur in both music and poetry, what is the equivalent or corresponding form that a painting can take? 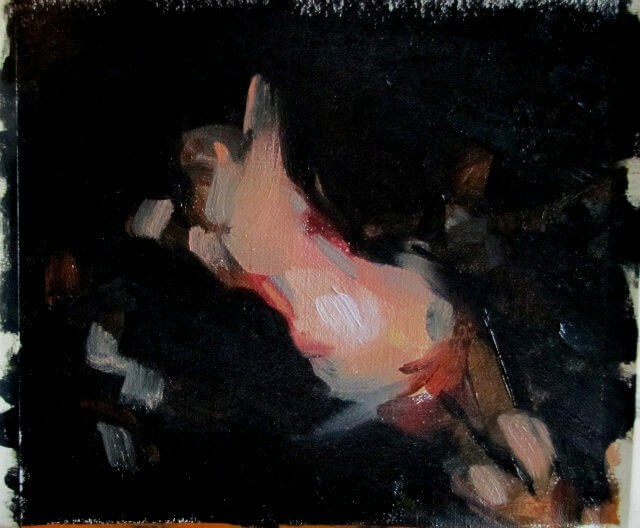 I have begun painting quick sketches in order to come to terms with how to depict such flight or the sensation of freedom of movement- carried away in the nocturnal world of images, memory and thoughts. I also would like the sense of the darkness to shape the image and have a character of its own, in a sense, for it to be an independent force as well, engulfing and freeing its subject. These are my thoughts as I prepare to work with a model- the model completing the triad (the artist, the preparatory work, the model) of the creative process. A powerful and mysterious image. The figure is very evocative and the darkness seems to me to be doing just what you wanted having ” a character of its own”. It is so dark and rich. I look forward to seeing more.